In today's world, everyone does many things to feel fit and stay youthful, from the outside. But, do you do anything to nourish yourself from the inside? At Seven Seas, we understand the importance of both. 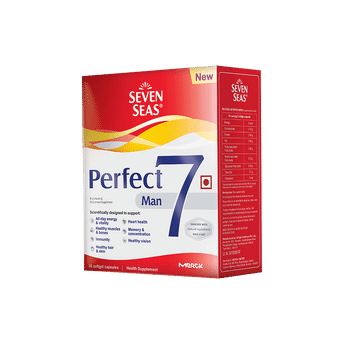 Our experts have developed Perfect 7 Man, which brings together 7 key benefits spedifically for today's man. Its scientific combination is enriched with a range of nutrients that nourish your body and meet its needs. Energy & vitality - Vitamin B1, Vitamin B3, Vitamin B6, Vitamin C, Iron, Magnesium and L-Carnitine help reduce fatigue and tiredness. Heart health - Vitamin B1, Vitamin B6, Folic Acid, Vitamin B12 and Citrus Bioflavonoids contribute to the normal function of the heart. Healthy muscles & bones - Vitamin D3, Magnesium, Zinc and Manganese help support healthy muscles and bones. Memory & concentration - Biotin, Pantothenic Acid, Folic Acid, Iron, Zinc and Iodine contribute to normal mental performance and normal cognitive function. Immunity - Vitamin A, Vitamin C, Vitamin D3, Copper and Selenium contribute to the normal function of the immune system. Healthy vision - Vitamin A and Vitamin B2 contribute to the maintenance of normal vision. Healthy Hair & Skin - Vitamin B1, Vitamin B3, Vitamin B6, Vitamin B12, Biotin and Copper help maintain healthy hair and skin. Additional Information: One of the world's leading health supplement brands, Seven Seas has provided the foundation for nutritional experts to develop a range of products built on the science of Omega-3 as being a building block in every cell within the body. Backed by scientific expertise and standard of excellence, the brand is committed to bringing you the best in class nutritional supplements for you and your family's good health. Explore the entire range of Multivitamins available on Nykaa. Shop more Seven Seas products here.You can browse through the complete world of Seven Seas Multivitamins .